At AWP we design & fabricate custom Cash Art Feature displays, as well as clothing racks and various other storage solutions for our North American clients. Our fabrication facility is located in Surrey, British Columbia, Canada. 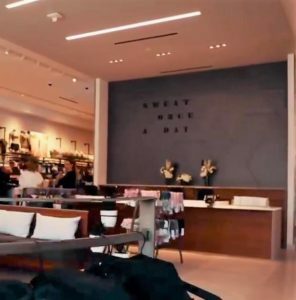 This Cash Art Feature (pictured below) was custom designed and fabricated for a Lululemon Clothing Store located in the famous Westfield UTC Shopping Mall located in San Diego, California. The Cash Art Feature is wall mounted behind the cash desk. 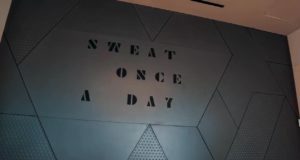 Its design style was carefully chosen as it reflects the cultural taste of the community in which the Lululemon store is located in. It features a custom font, various geometrical shapes and a metal processing technique known as “debossing” – this process creates a recessed relief in the custom designed and manufactured triangular shaped metal sheet. This process creates the dimple effect (seen in the picture below) in the panels of the decorative metal. This Cash Art Feature highlights AWP’s ability to manufacture retail store display pieces and storage solutions for any design and size requested and showcases the use of decorative metal fabrication procedures. The Dimensions of this feature span from nine foot in height, as well as 14 feet in width. The size of this piece was specifically chosen to cover the entire length and height of the wall behind the cash desk. We at AWP pride ourselves in providing high quality and custom-built artistic display pieces, as well as storefront storage solutions. We utilize the most advanced and efficient metal fabrication technologies. You can contact us with a specific design in mind. Alternatively, our design team can also assist you in creating the display solution that suits your business best. Our friendly design and production teams have many years of experience in the metal, plastic & wood fabrication industry, and are ready to assist you with your project.